There are a million old cocktail recipes out there. Sometimes, you’ll stumble upon one that’s really intriguing, as I did recently with the Marconi Wireless. It’s not only tasty, it’s got all sorts of cool historical and cultural connections. I was flipping through a 1957 paperback that my significant other, Scott, picked up at a flea market recently: The Art of Mixing Drinks (“Based on the famous Esquire Drink Book” exclaims the book’s cover). I was looking for a recipe using applejack; luckily the book has an entire section on applejack cocktails. The Marconi Wireless caught my eye: 2/3 applejack, 1/3 Italian vermouth, 2 dashes orange bitters. ‘Hmm, I bet that’s good. And it’s so simple!’ I thought. Sure enough, it was a snappy, satisfying drink, and we had to find out more about it. With a little digging, we found a 1992 New York Times article that William Grimes wrote on historic New York City hotel bars. It turns out that the Marconi Wireless was among several potions invented at the Waldorf-Astoria, and it is listed in the Old Waldorf-Astoria Bar Book. When was the cocktail invented? 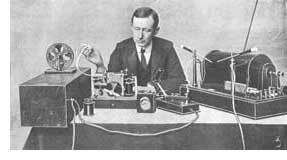 Perhaps when Marconi was feted by the American Institute of Electrical Engineers at the Waldorf in 1902 for his role in pioneering radio communication. Or maybe later, in 1912, when Marconi gave testimony at the Senate hearings at the Waldorf on the Titanic disaster. One of the things he was questioned about was how Marconi Company wireless operators who survived the wreck came to receive payment from the New York Times for their stories. In 1902, the cocktail would be an homage. In 1912, a jeer. Thoughts, anyone? Fun sidebar: our research also led us to the term “cocktail party effect.” The term emerged in the early days of air traffic control, when the difficulty of discerning the intermixed voices of pilots over one loudspeaker was compared to that of zeroing in on one conversation amid the loud chatter of a cocktail party. Hey, Thats my friends great great grandfather! !